Summary: If you knew the date of your death, how would you live your life? WOW WOW WOW! I've been on a reading roll this month, and I've read a few books that I already think will go down as some of my favorites of 2018. 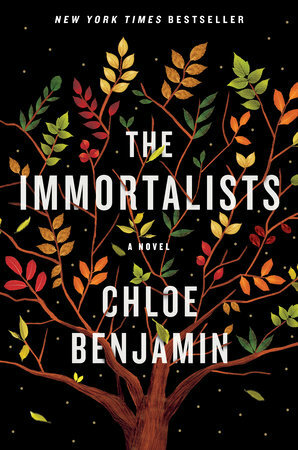 The latest novel that I've read and absolutely loved is THE IMMORTALISTS by Chloe Benjamin. It's highly unlikely that you haven't already heard about this book because it's getting some major buzz, but just in case, I'll give you a quick summary of its premise. THE IMMORTALISTS tells the story of four siblings (Simon, Klara, Daniel and Varya) who learn the dates of their deaths from a psychic in 1969. It then follows each of their lives for the next five decades as they navigate their lives "knowing" when they will die. In the early 1980s, as a teen still in high school, Simon heads to San Francisco with his older sister Klara looking for the freedom to live the life he craves. Klara is determined to become a magician and eventually leaves San Francisco to make it big in Las Vegas. Meanwhile, Daniel becomes an army doctor after the U.S. is forever changed after 9/11; and Varya, the eldest child, decides to devote her life to researching longevity. THE IMMORTALISTS is, at its heart, a family saga that covers fifty plus years of four siblings' lives. I loved discovering the paths of these four individuals' and the decisions they made when they (possibly) knew how long they had to live. The book is extremely well written -- I can't say that enough, and the characters' lives were incredibly interesting. And I would honestly love this book just based on these characters' lives alone; however, THE IMMORTALISTS is so much more just a family saga. This novel is absolutely amazing in that it has a great storyline with intriguing characters, but it also explores an interesting idea that knowing the date of our death can affect the choices we make all through our lives. In addition, this book explores some huge themes including love, loss, and family -- topics that each reader will be able to relate to in their own way. I could not put down this novel and I think it's one of the best books I've read in years. I loved everything (and I mean everything) about this book. Even the way the story was told -- in four major sections with one for each sibling was perfect. Each section began where the last one ended, and I appreciated how beautifully written each and every page was. All in all, I found this book to be totally engrossing! If you are part of a book club, then I beg you to consider THE IMMORTALISTS for your next meeting. Unfortunately, I'm not scheduled to host for awhile, but I'm hoping that one of my friends will pick this book in the near future. This book is a great read, but it's an even better book to discuss among friends. In fact when I finished this book, I was sad that I didn't know anyone else who has read it yet... because I was dying to talk about it. There is a fantastic reading group guide available with ten questions. Some of the themes you might want to explore include fate/destiny, the power of belief, freedom, death, and family. There are also some recipes for fun book-related cocktails as well as a pattern for a cute paper fortune teller. I'm not exaggerating when I say that THE IMMORTALISTS is the perfect book club selection! I received a copy of this novel from the publisher at last year's BEA. I tried reading The Immortalists. I checked it out from the library - 7 day loan. Ugh. I didn't pick it up until day 3, and I just couldn't get into it. Because I didn't have the time, I returned it. I don't think I'll try again unless I get it on audio. I keep hearing great things, but the beginning was just too slow for my taste. I’ve got to make time for this one!! This is another book I am anxious to read. I heard the author in an interview a few weeks ago and it really peaked my interest. Thanks so much for your terrific review! Wow, that sounds like an amazing book! I haven't had the best luck lately with books. I read two last week that were good, and the rest were just okay.